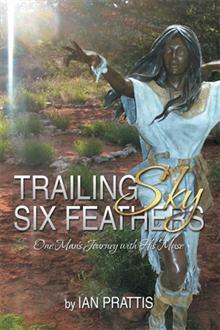 Excerpt from Chapter Six of Trailing Sky Six Feathers. The setting is Sedona, AZ. I simply marvelled at the surrounding scenery. It felt like being in nature’s cathedral, in the centre of a natural temple. The Red Rock country emanated a sense of familiarity that many people visiting for the first time feel intensely. I was no different. After settling into my simple yet comfortable cabin, on that first evening I took a flask of coffee, bread and cheese and sat at the foot of Eagle Rock, the aboriginal name for Bell Rock, not far from Quail Ridge. I carefully looked over maps of the area to acquaint myself with the region’s ambience. I saw that Oak Creek ran through the Red Rock country like a thread drawing the canyons together. My exploration began with this Water element. This was one component of the Five Great Elements in Buddhist thought that I was familiar with, Earth, Water, Air, Fire and Space. I understood the sequence as the correspondence of all things to each other driven by the feminine vessel of enlightenment. I have always thought of the present millennium as the century of the daughters. Not so much as a gender separate thing, but as attributes of a holistic, nurturing presence of mind. This is why I began my exploration of the region with Water. Oak Creek was fed by spring water from the sacred canyons and she carried their unique energies in one stream. I began at Red Rock Crossing, fully aware that I was being guided by the feminine qualities of the region. But not aware of how deeply this river ran through me. I arrived at the crossing by taxi and asked the driver to return for me just before sunset. I stopped to look around at the awesome vista around me. This was where Oak Creek runs by the west side of Cathedral Rock, a majestic, soaring rock formation that defies imagination. I looked for the tall figures in the central towers, representing a Male and Female figure standing back to back. The myth was that they embodied the eternal values of harmony with all elements, earth and peoples. Black Elk’s prophecy of the hoops of all nations interconnecting with harmony, no less. Cathedral Rock’s sandstone towers cast a shimmering reflection in the waters of the creek. Water, rock, sky, wind and fire, elements bound together in a seamless continuum. That is what I felt as I walked in the shallow waters with my hiking boots strung around my shoulders. From Buddha Beach, what an apt name, on a bend of the creek, I found a trail that led to the sandstone towers. I chose not to climb them. It was enough for me to stand in awe below them, with my feet firmly planted in the waters of Oak Creek. This day was about Water, not my ego. 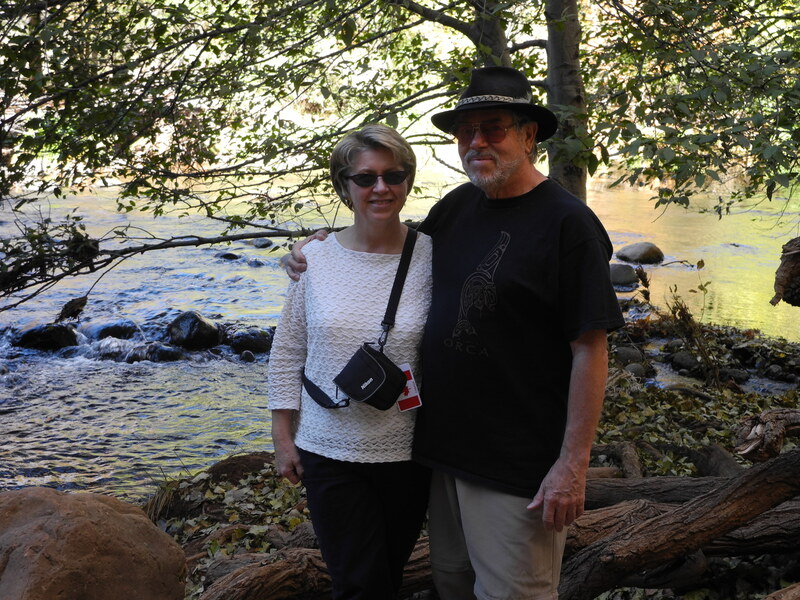 I learned more about Oak Creek and its surroundings with several days of exploring Oak Creek Canyon to the north of Sedona. Always, I waded into the water so I could feel with my feet the pulse of the arteries of the entire area. I would lie down on larger, flat, dry rocks in midstream or perch atop rock rills and watch the water swirl around my feet, feeling a great sense of familiarity with this dramatic and melodious river. 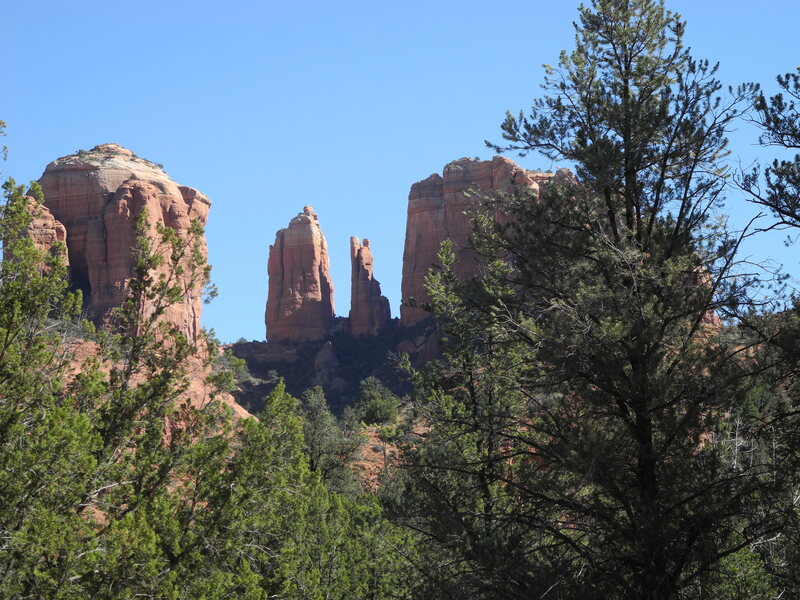 It was easy to explore the rim of Oak Creek Canyons, as the Schnebly Hill Formation was available by road from North Sedona, as it stretches into the highlands of the Colorado Plateau. I also took Brewer Road to the end and walked down the path leading to perhaps the most beautiful part of Oak Creek and listened deeply to the rhythm of this river.